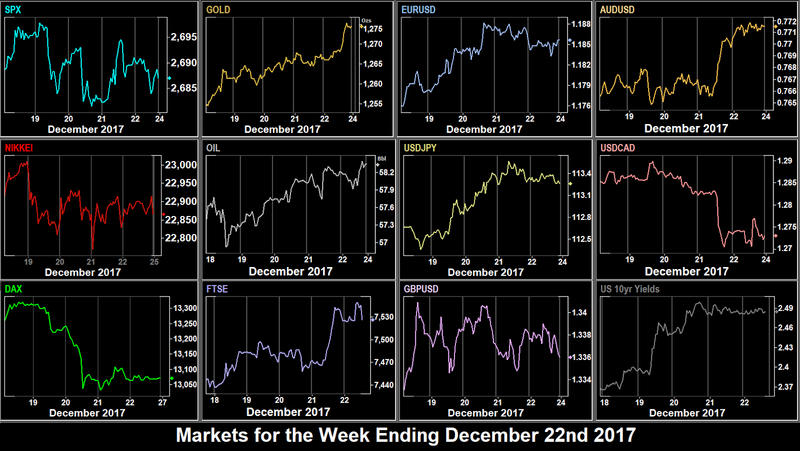 As the tax bill neared completion, markets rose again on Monday, with SPX, DJIA and NDX all closing at record highs again. An index we don’t normally cover, the Nasdaq Composite index (IXIC, normally traded with the COMPQ ETF) crossed the psychological 7000 mark. Other indices followed suit with DAX, NKY and FTSE also up. NIFTY spiked down 3.3% on early polling returns in the Gujarati election, but bounced back as Modi’s BJP emerged victorious. The election of Cyril Ramaphosa as head of the ruling ANC caused a huge surge in ZAR, up 4.3% at one point. USDZAR closed down 2.7% on the day. USD was weak across the board, giving up ground against all currencies, particularly GBP which rose 0.5%, reversing the previous Friday’s losses. Gold was up in line, however 10-year bond yields were surprisingly also up slightly. It was a clear Turnaround Tuesday this week. SPX pulled back sharply, triggered by a large bond sell-off, with 10-year yields up 7bp. Gold was up in line, and other indices were also down, although FTSE held steady as GBP performed a turnaround as well. Although JPY and CAD were also down, a 0.5% rise in EUR (57.6% of DXY) on the back of positive German IFO Sentiment at 0800 meant the dollar index was down on the day. Gold and its proxy AUD were flat, but Oil also did the Tuesday thing, and recovered the previous day’s losses. Wednesday’s price/action was largely a repeat of Tuesday in many markets. SPX and other indices fell again, as the tax bill was finally completely in the Senate, suggesting that there might be a “buy the rumor, sell the news” pattern in play. DAX in particular fell sharply, giving up 214 points (1.62%) at one point, following the Producer Price Index miss at 0700, and the continuing strength of the euro. NKY and FTSE were relatively muted but still gave up ground. The bond sell-off continued, adding another 4bp to yields, and JPY and GBP continued to fall. However the continued strength of EUR mean another red candle for DXY, and indeed AUD with Gold and CAD with Oil were also slightly up. The SEK rate decision we mentioned last week caused a 70 point spike up for the Stockie which was immediately retraced. Despite the misses on US GDP and Personal Consumption Expenditure at 1330, SPX was back up again on Thursday as the bond sell-off ended, and yields were flat on the day. Elsewhere, the standout performer was FTSE up over 1% intraday, and closing at 7601, a new all-time high. However DAX recovered only slightly, and NKY was flat, with price/action similar to Wednesday. After the GDP and PCE (CPI proxy) misses at 1330, USD was down again against most all currencies except EUR, which gave up some of its earlier gains. AUD was particularly strong, pushing through the 200-day moving average to put on 51 pips (0.67%) on the day, and the ASX200 index closed at a new 10-year high. Similarly CAD rose sharply rising 120 pips (0.93%) after the Canadian CPI beat at 1330. Gold was flat, and Oil continued upwards, and NZD was up substantially after the GDP beat at 2145 Wednesday. Friday was a half-day for the Christmas holiday. The US Government shutdown was kicked down the road to Jan 19th, and the Catalan separatists won their election, causing a 1.2% decline in the IBEX. The big story of the day was Bitcoin. The cryptocurrency had been falling all week from last week’s near $20,000 high. On Friday it plunged 31% to a low of $10,414 (on Coinbase) before recovering. However, the currency is still up on the month. SPX fell at the US open although it then recovered to close only slightly down. European indices were flat, given the half-day, as was NKY. NIFTY was up, and posted a closing all-time high. The forex session ran for the full day, but dollar movement was also muted. CAD briefly spiked down 80 pips on GDP miss at 1330, but other than a GBP pullback movement was slight, and DXY finished 0.1% up. Bond yields were similarly flat, but surprisingly Gold had a small $7 rally. Oil continued up to close at a 4-week high. These are the prices movements for the week on the instruments we cover, with USD pulling back for a second week, against all currencies except JPY. After two weeks as worst performer, CAD was the best this week, so buying CADJPY would have been the best forex trade, up 1.70%. NZD, GBP and JPY all had inside weeks against USD. NIFTY was the strongest index, although FTSE rose over 1% for the third week in a row. Once again, Oil was the overall top performer. As you would expect, next week is very quiet. 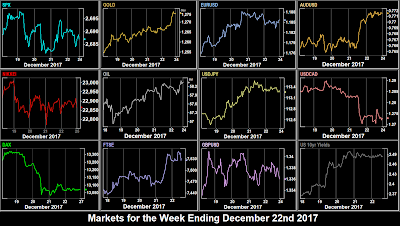 Monday is Christmas Day and all markets, including forex, are closed. On Tuesday, known as Boxing Day in the UK, Australia and New Zealand, all major markets except the US and forex are also closed. Business proper commences again on Wednesday, but trading is expected to be light. It will be interesting to see if the second ‘Santa Rally’, the one between Christmas and New Year materializes. The news calendar is very light, as it is on Thursday. The only major volatility item this week is German inflation on Friday, although even this is unlikely to make waves. Markets will again be closed the following Monday for New Year’s Day, and 2018 starts on the Tuesday.